Experience Anna Maria Island in one of your very own scoop coupes from the Segs by the Sea. We offer 1 to 4 hour, or all-day rentals. For multi-day or overnight rentals, please call for pricing. A scoop coupe from Segs by the Sea is the perfect way to get around and explore all that the island has to offer. 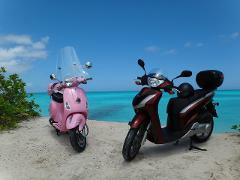 Segs by the Sea is the premier place to rent scooters, electric bikes and golf carts. The store is open 9:00 am to 5:00 pm 7 days a week. Our trained staff offer free training to ensure your safety. Our staff will be sure to point you in the right direction for things like restaurants and water sports. All drivers must be 21 years or older and hold a valid driver's license.